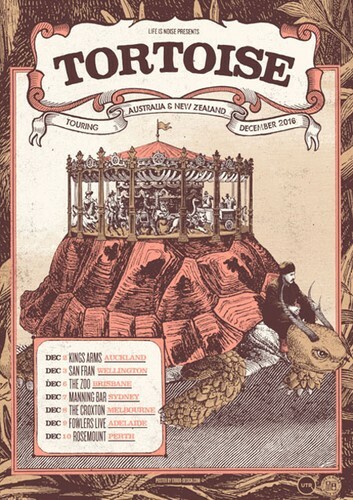 Life Is Noise is extremely excited to announce the return of Tortoise to Australian and New Zealand shores, this December. The Chicago instrumentalists will be bringing their genre-defining ‘post-rock’ to Auckland, Wellington, Brisbane, Sydney, Melbourne, Adelaide and Perth. "It is easy to forget that the now sprawling umbrella category of ‘post-rock’ meant nothing before Tortoise and their ilk introduced the nineties to the expansive potential of the genre. By infusing their unpretentious prog rock stylings with elements of jazz, dub, punk and Krautrock, the band invented a slow-burning form of instrumental music that, as it turned out, kickstarted the Wolverine of all musical genres." - The Quietus. One of the most significant forces of the post-rock movement, Tortoise, is back. After 25 years together and a seven-year break between albums, the quintet have returned with one of their most interesting, intelligent and improvisational recordings to date, The Catastrophist. Born from entirely different origins to their previous six releases, The Catastrophist was sparked by a commission from the City of Chicago to develop a series of pieces inspired by their hometown’s storied jazz and music scenes. The Catastrophist marks a subtle change for the band, with more cohesive elements amongst their usual penchant for experimentation, plus the notable addition of vocals making their debut on select tracks. Featuring guests from Yo La Tengo and U.S Maple, The Catastrophist reveals a new direction for the band that is more mature but still doesn’t stray from their trademark atmospheric guitars and opulent percussion. Tortoise live is an experience in itself. Utterly entrancing from start to finish, their set is an epic journey - from the devastatingly quiet moments to crushing and emotional highs. Splicing everything from dark energy, stilted beats and cold electronics with jazz, prog, indie and more organic ties - the musical landscape they create is not to be missed. Tickets from UTR, Flying Out (AKL), RPM and Slow Boat (WTN).